What the court will look like if Merrick Garland prevails. Entry 20: The future liberal court. 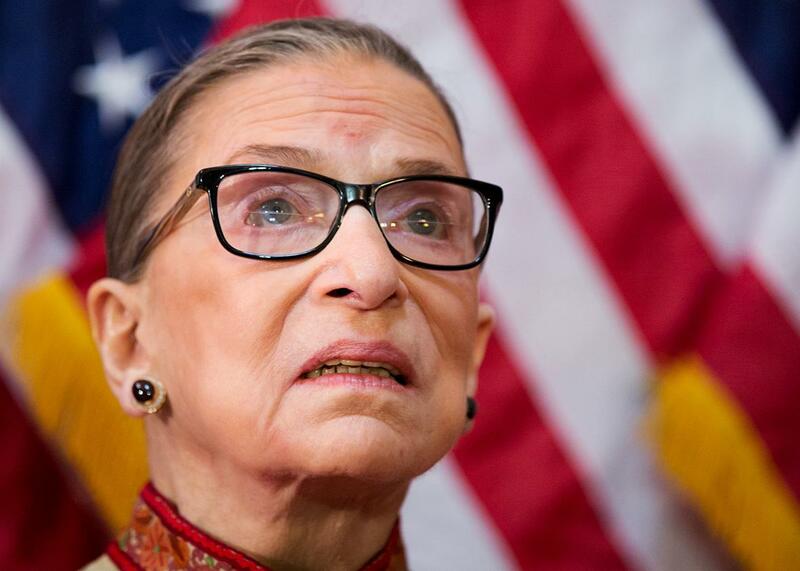 Justice Ruth Bader Ginsburg on Capitol Hill in Washington on March 18, 2015. I’m bored with Anthony Kennedy! Let’s talk about the liberals. Everyone seems to agree that if and when Judge Merrick Garland becomes Justice Garland, the liberal bloc will split into factions. That seems undeniable: Right now, the liberals vote together for primarily pragmatic purposes, smoothing over disagreements in a quest to find a fifth vote for the outcomes they prefer. Justice Ruth Bader Ginsburg famously held a strategy session during the first Obamacare case, encouraging her colleagues to agree with whatever logic Chief Justice John Roberts used to uphold the individual mandate. When Kennedy chose to write the marriage equality opinion himself, Ginsburg purportedly urged her fellow liberals to join whatever opinion he produced, even if it wasn’t their preferred rationale. The liberal bloc’s unanimity hung together this term, with one glaring exception, in every major case. But in the smaller cases, and on the sidelines of the blockbusters, the liberals often scattered in fascinating ways. Their unexpected and unusual voting patterns might presage the divisions that are bound to develop once liberals can disagree among themselves and still reach five votes for a progressive result. Consider Monday’s decision in Voisine v. United States, better known as the case that made Justice Clarence Thomas speak. Voisine involved a federal statute that bars a person convicted of a “misdemeanor crime of domestic violence” from possessing a firearm when that crime involved “the use of physical force.” The question in Voisine: Does a misdemeanor assault conviction for merely reckless conduct—dangerously careless behavior that unintentionally causes physical harm—qualify as “the use of physical force” under the federal law? Sotomayor and Thomas’ partnership is really quite logical: Sotomayor cares deeply about defendants’ rights; Thomas is dubious of federal power in the realm of criminal law; and here, both interests neatly aligned. That’s why the two teamed up for a case earlier in the term, Torres v. Lynch, to argue against a reading of a federal law that gave the government excessive latitude in determining which criminal defendants are “deportable.” And it’s why Sotomayor paired with the chief in Ocasio v. United States to dissent from a decision broadening the government’s power to prosecute for conspiracy to commit extortion. (Roberts is similarly skeptical of Congress’ power to make and enforce criminal law—a task traditionally left to the states.) The makeshift dream team of Sotomayor and Roberts also dissented together in Bank Markazi v. Peterson, a separation-of-powers case that expanded Congress’ ability to guide courts toward a certain result in specific criminal cases. If Sotomayor and Ginsburg now serve as the court’s left flank, Kagan and Breyer comprise its moderately progressive center—sometimes along with the left-drifting Kennedy. The two share similar temperaments, judicial philosophies, and modes of statutory interpretation; they’re also tacticians, building consensus where Sotomayor and Ginsburg refuse to compromise. Unfortunately, the most interesting liberal vote this year was also the most devastating: Breyer joined the conservatives to slash into the exclusionary rule, providing a fifth vote to allow what should be considered illegally obtained evidence to be used at trial. Breyer is notoriously weak on the Fourth Amendment, and his votes on search-and-seizure cases can be erratic and unpredictable; he seems to value flexible, police-friendly conclusions over, well, the Constitution. He appears to share this quality with one Merrick Garland. This time next year, we may well be talking about the impact of a Breyer–Garland alliance on constitutional law.